Some weeks ago we have choosen Christine Hoopers poetry film On Loop as FILM OF THE MONTH MAY 2015. She is a film maker based in London and kindly answered some questions via E-mail. 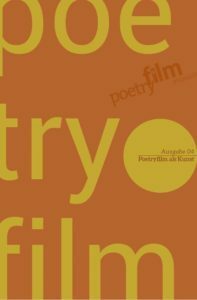 Poetryfilmkanal: How did you develop the idea for the film On Loop? Hooper: On Loop started life when I came across an interesting quote from film critic Bill Nichols which I found whilst writing my dissertation; ›Every film is a documentary‹. He argues that every film, even the most whimsical of fictions, gives evidence of it’s director. From the culture they were brought up in to their personal experiences, it is played out within their work. So I decided to make a film drawing on my personal experiences – to give a feel of authenticity but not be restrained by the documentary format. One thing I had a lot of experience of was insomnia, so I chose that as the theme. Films which strike a chord with me are usually either those which I have identified with or those which have made me laugh. I wanted to make a film that other insomniacs could identify with. One that they could watch and think, ›Oh I do that too!‹, to make them feel less alone. Also, by making it a comedy, I wanted to enable insomniacs to laugh at insomnia. By poking fun at the irrationality of those thoughts I hope that when next tackling a sleepless night someone might remember it and it bring some light relief. Why did you decide to choose the form of a poem instead of a common voice-over text? A few years back I was wondering around at a music festival and it suddenly started to pour down with rain. I took cover in the nearest tent, never ventured to before due to preconceptions, but shelter was needed! It was the poetry tent. If it wasn’t for it’s proximity I may never have gone in but I’m so glad it rained. The spoken word poet-comics opened up a new world to me. I felt the rhythm of this format was a perfect fit to convey the repetition of thoughts felt when suffering from insomnia. Can you tell us about the poem in relation to the rhythm and the imagery of the film? Was it difficult for you to work on the timing of text an imagery and was it necessary to change, shorten or re-write parts of the poem as you were working on the film? The poem and the visuals came together hand in hand. Each line was written to be paired with a visual so that they worked together to convey the message. I spent time working through the poem and refining the storyboard, then created an animatic to get a feel for the timings before I went onto shoot. I usually write too little than too much so the length wasn’t too much of an issue. Is there a reason that you wrote the poem together with Victoria Manifold? I had never written a script before and felt unsure of my capabilities. Having someone to bounce ideas of, at whatever stage or confidence level of writing, is a really valuable tool as you can tell instantly if it is funny or not. Do you think that the poem would work as a pure written text, or does it express its full meaning only as being part of the film? I wanted the visual and the voice over to be inseparable, so that the combination of the picture and the sound work together to tell the narrative, not one just illustrating the other. The film is full of jokes where the punchline is visual so I think the poem alone does works but has a very different darker feel. Who is the lady who enters through the door at some point? Ha! It is someone specific but I can’t say! In general it was inspired by those passive aggressive people who dish out complisults. A complisult is a mixture of a compliment and an insult. These are comments you get, such as ›it’s interesting‹, that you think were a compliment, then at 4am realise the person was probably backhandedly being rude. Christine is an award winning animation director and graduate from the Royal College of Art Animation MA. Her graduation film On Loop, a venture into the head of an insomniac voiced by comedienne Susan Calman, has been shown at over 50 film festivals worldwide including Annecy, LSFF and LIAF. It has won multiple awards including the Terrence Conran Foundation Award, Lumen Animate Award, Vimeo Staff Pick and has had over 200k views on Vimeo to date.